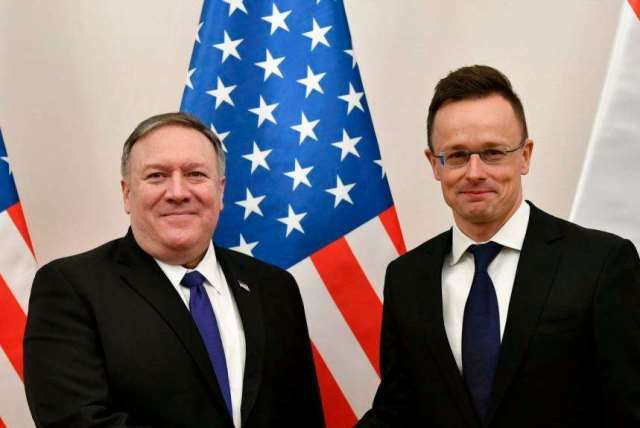 VOA File: Hungarian Minister of Foreign Affairs and Trade Peter Szijjarto, right, shakes hands with US Secretary of State Mike Pompeo in the ministry in Budapest, Hungary, Feb. 11, 2019. WASHINGTON — On the sidelines of two days of events marking the 70th anniversary of the founding of the North Atlantic Treaty Organization (NATO), the United States signed a bilateral defense cooperation agreement with Hungary, an act that went almost unnoticed by American media. Hungarian media, however, widely published the news Saturday, quoting Hungary’s Minister of Foreign Affairs and Trade, Peter Szijjarto, as saying this is a “modernized version” of an agreement reached 20 years ago. Daniel S. Hamilton, a transatlantic expert at Johns Hopkins University, told VOA that the agreement serves as a means to channel U.S. funding to signatory countries under the European Deterrence Initiative (EDI), “largely for infrastructure improvements but also related to missile defense coop(eration).” The United States, he said, has similar agreements with a number of allies and is negotiating with more.